CARACAS (Reuters) - Venezuelan authorities detained opposition leader Juan Guaido's chief of staff on Thursday in a pre-dawn raid, an escalating crackdown by President Nicolas Maduro against his opponents that the White House said would "not go unanswered." They have threatened ever harsher sanctions intended to further isolate Maduro and cut off his administration's sources of revenue, but the humanitarian and political costs of further blanket measures could be high. Millions of Venezuelans are already suffering shortages of food and medicine. "The toughest sanctions are yet to come," Bolton said on Twitter. "Unless Maduro's usurpation ends, he and his cronies will be strangled financially." A U.S. State Department spokesman condemned the raids as a sign that "Maduro is betting on repression to hold on to power. It will not stand. There will be consequences for a continued crackdown." Venezuelan Interior Minister Nestor Reverol said authorities had seized an arms cache from Marrero during the raid and said he was "directly responsible for the organization" of criminal groups. On state television, Reverol showed an image of two rifles that Marrero allegedly had in his possession. 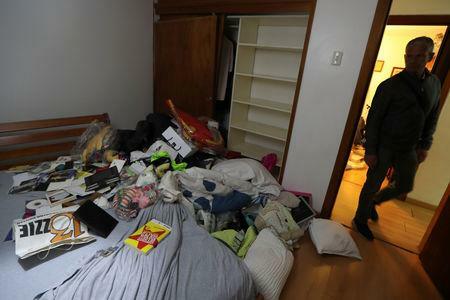 Guaido had said earlier that SEBIN agents had planted two guns and a grenade in Marrero's home during the raid. Rights groups say Venezuelan authorities have a long history of planting evidence to justify charges against opposition politicians and activists, which the government denies doing. SEBIN agents also arrested Vergara's driver, Luis Aguilar, who Reverol later accused of being Marrero's bodyguard. Maduro said in a televised broadcast that authorities were in the process of "dismembering the whole terrorist group and turning them over to the justice system," without mentioning Marrero or Guaido. The United Nations human rights office tweeted its concern and urged the government to respect due process. The Lima Group regional bloc also denounced Marrero's arrest and said Maduro was responsible for his safety.